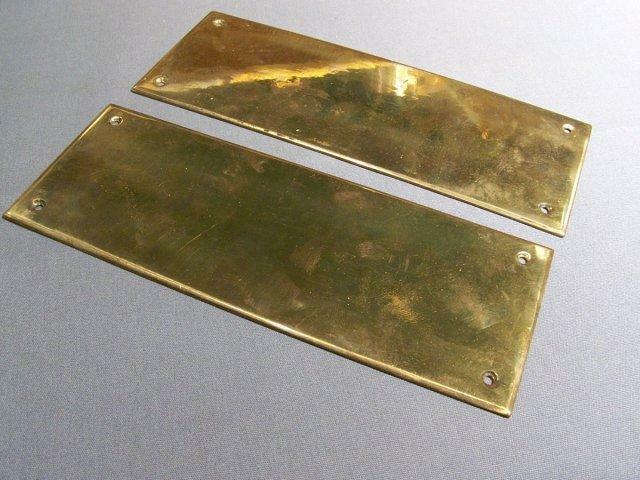 Price Is For THE PAIR Of These Old, Solid Brass, Push Plates That Have A Nice Polished Brass Tone; [sorry that photo shows one plate as being darker than other and that further plate shows a reflection]. Both Plates Have Identical Polished Tone. Unusual Size Pair Of Plates. Have Minimal Wear. Appx. 8" x 3" Overall Measurements. Mount By Four Screws Into Front Of Each Plate. 1 PAIR Available. Please Email Or Call Us For The Shipping Cost, Before Submitting Payment. Purchaser Pays Shipping.